From toddlers to tweens, enjoy a diverse range of classes that includes dance, acting and yoga. KST’s Alloy School is an 8-week-long creative and noncompetitive community where learning is guided by professional dancers and master teachers. Our curriculum is designed to teach students fundamental skills in a comfortable and engaging atmosphere. Classes are “Pay What Makes You Happy” and the Spring season ends with a special Alloy School Showcase in conjunction with our Let’s Move! 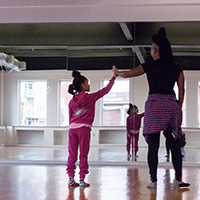 Family Dance Party at the Kelly Strayhorn Theater on April 6, 2019. Registration for a single class or full 8 week session. Drop-ins are welcome until there are no longer tickets available for purchase. Classes sell out fast, pre-registration is strongly encouraged. Choose a suggested level, or Pay What Makes You Happy! Answers to many frequently asked questions can be found in the Alloy School General Information. For more info, please contact Manager, Alloy Studios & Community Engagement, Desiree Lee at 412-363-3000 or desiree@kelly-strayhorn.org. For any class that is unavailable please click here to join our waiting list. The Alloy School is made possible with generous support of the McKinney Charitable Foundation through the PNC Charitable Trusts Grants Review Committee, and Highmark Blue Cross Blue Shield.